That’s the only word I can use to describe how I felt this morning. I’m still chilled to the bone, from standing in the pouring rain late last night at the gas station, when I wake up to the sounds of wind scratching and howling at my window. I look over at my friend Nora, who’s been my sleepover buddy since the beginning of high school, and we both groan, wanting to burrow deeper under the covers and steal all the warmth from my hot water bottle-like kitty. I invited her over to be my brunch buddy, since my parents are out of town and I rarely like to eat alone. So I know I need to get out of bed. We are both in serious need of a pick-me-up that can thaw our freezing toes and furrowed brows – and I’ve got a large pile of fruit in the fridge that I’m sure will help brighten up the day. This is a crepe morning. And it’s going to be full of earthy spices, tangy-sweet fruit and a little butter. 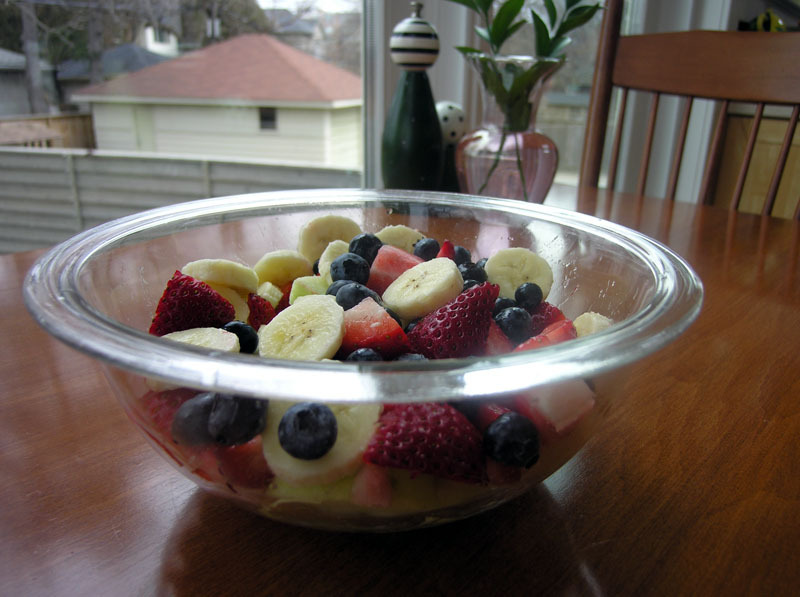 Chop up banana, apple and strawberries into large chunks and squeeze a little lemon juice on the apples to keep them from browning. 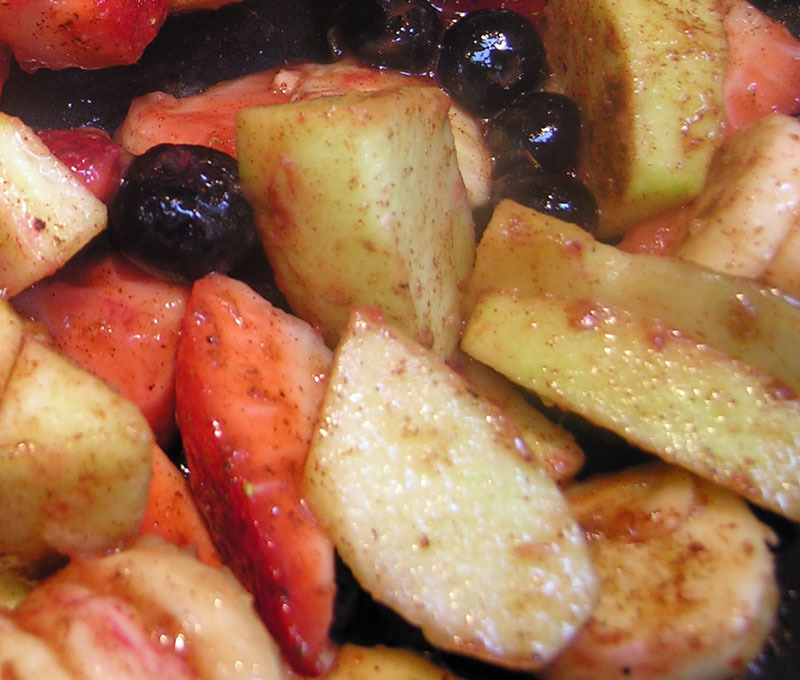 Toss all the fruit with the nutmeg and cinnamon in a bowl. In a medium-sized pan, over medium heat, melt the butter and stir in the brown sugar so you have a syrupy liquid. Pour in the spiced fruit and let it cook for about 5 minutes, until soft but not mushy. Pour in the orange juice and let it cook for 1 minute. 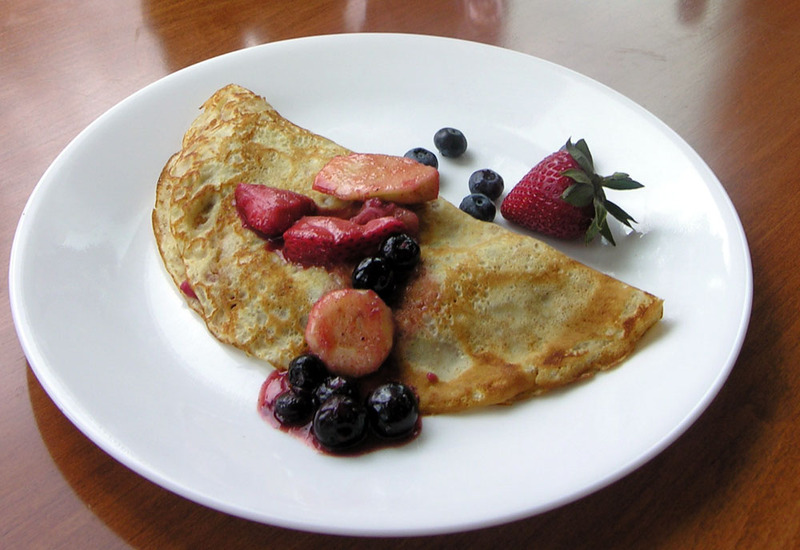 Fold into crepes and serve. For the crepes, you can use any standard recipe. I swapped half the white flour for whole wheat and added a little vanilla to a basic recipe and whisked everything together in a bowl. I used 1/4 cup white flour, 1/4 cup whole wheat flour, 1/2 Tbsp sugar, 3/4 cup milk, 1 egg, 1 Tbsp melted butter, 1/2 tsp vanilla and a pinch of salt. It made enough batter for 4-5 crepes in an 8-inch pan, which was perfect for two – and they only take about a minute and a half each to cook. If you’re dreading getting out of bed in the morning, you can whip these up in about 15 minutes. They’ll give you the the extra push you need to get out the door. You can just make the filling if you’re short on time and eat it with some plain yogurt or scoop it on top of a waffle. The great thing about this recipe is you can use pretty much any fruit you have lying around. I like to keep a little tangy flavour, which I did with green apple this time, but adding a handful of cranberries or a grapefruit could do the same thing.